Boy Scouts propose policy change allowing gay adult leaders. 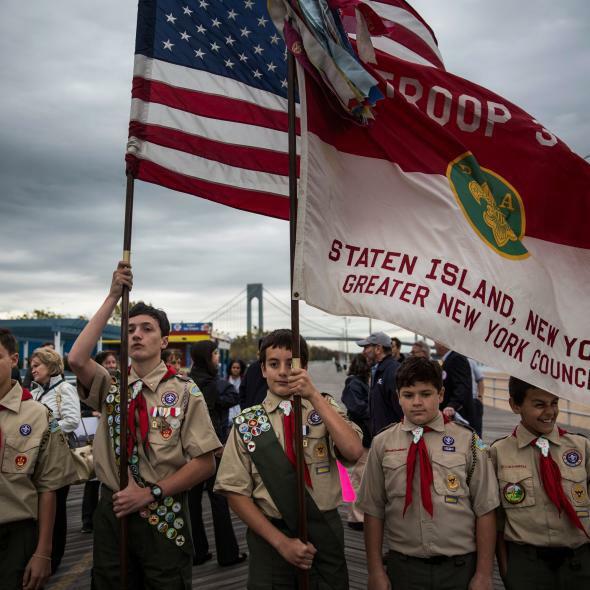 Boy Scouts of Troop 37 prepare to lead a march on Staten Island to mark the two year anniversary of Superstorm Sandy’s landfall. The Boy Scouts of America (BSA) took a step another step towards equality on Monday, as the organization’s executive committee unanimously approved a resolution that would end its ban on gay scout leaders. In 2013, the Boy Scouts changed its longstanding policy and allowed gay scouts to participate, but a blanket ban on openly gay adult leaders of scout units is still in place. The Boy Scouts’ National Executive Board will meet to ratify the change on July 27.